The 2001 Key Sheets consists of 65mm color film frames and 2x2 inch color transparencies which have been matted and mounted onto sheets of Plexiglas. Each image is individually numbered for reference. These numbers coincide to the ones printed on the publicity still prints from the film. 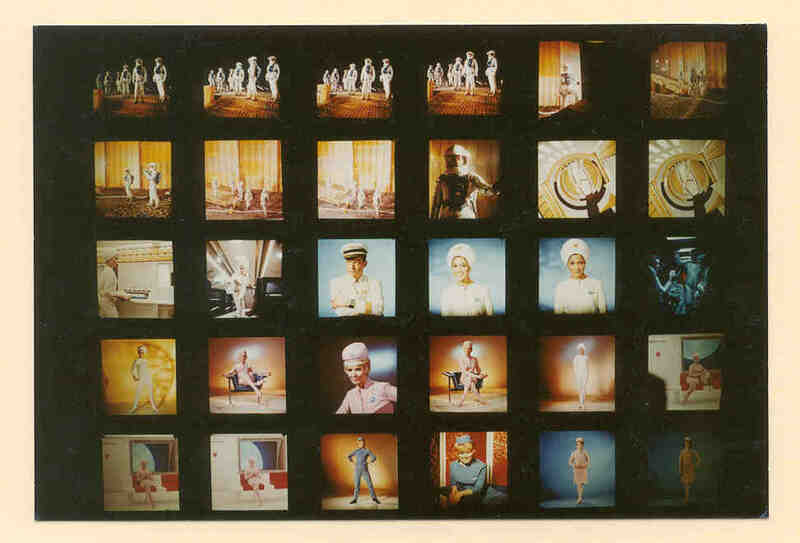 I was told, when I purchased the Key sheets that they were used by Kubrick to identify which images were to be used for publicity. Those images have been identified with a white grease pencil marked "X" . I have 9 sheets total, 6 sheets with 65mm transparencies (49 per sheet) and 3 sheets with 2x2 transparencies (30 per sheet) as well as other unmounted transparencies. These transparencies have provided a wealth of information for the 2001 projects. While the images on the laser disc, and DVD versions of 2001 are good, they don't have the resolution for one to see a lot of the details that are visible on the film versions. I had always wanted to know the wording for the Explosive Bolts instructions on the Pod door, but the resolution of the video versions wasn't sufficient to make them out. When I was finally able to purchase an old 35 mm (anamorphic) film version of 2001, I did so even though it was expensive. While the resolution of the 35mm film frames is much less than the 65mm frames, the 35mm film frame was clear enough to be able to make out all of the wording on the Pod door when magnified. The film frame images when corrected from the anamorphic format, have been useful since there images from every scene in the film. There are many still photos from the film consisting of publicity images as well as film frame prints both in color and B&W. Most of these are a subset of the images from the Key Sheet images, but are in hardcopy print format.